Any individual or corporate entity entering the mainland China market needs assistance from an experienced China tax advisor, a role no one fills better than Fung, Yu & Co CPA Ltd. Even businesses set up as Wholly Foreign Owned Enterprises (WFOE) must expect to pay China taxes on several levels. And while the China tax situation may be complex—as is always the case when entering a new and unfamiliar market—it’s not as difficult to navigate as most think, as long as you have help. We can leverage our many years of experience as a China corporate tax advisor, and our intimate knowledge of the financial and governmental landscape of China, to help you bring your products and services to the local market segments that need and want them. Our goal is to help you navigate the WFOE financial path to your best advantage, even as China continues to evolve. Change is always in the air as China seeks to improve its position in the financial and business world, and with our guidance, you can settle in without any missteps in regards to the tax structure in China. Because China continues to move away from its former isolationism, its government, financial, and cultural aspects continue to evolve at a pace that, to many, seems amazingly fast. The tax structure in China may seem especially confusing to some. But that’s the nature of international business these days. Businesses must execute quickly in order to maximise profit, and the best way to do so when presented with local details is to recruit local assistance for your WFOE. That brings you to our expert team. Our China tax assistance program will help you stay on the correct side of the regulatory line while retaining as much of your hard-earned profits as possible. Fortunately, China has negotiated tax fairness laws with other nations in Asia and elsewhere, so you won’t have to double-pay if you do business with both China and one of its partners. Since China is an evolving economy, its regulations and laws in regards to WFOEs may change over time. In addition to national changes, the rules and practices vary from city to city, province to province. There is no need for any concern as we track all relevant changes closely, to insure your interests remain safe. Fortunately, Fung, Yu & Co is multilingual, at home with English, Cantonese, Mandarin, French, and the other major languages of finance such as Russian. This gives us an excellent advantage in the local financial marketplaces. Our teams are always tailored to your needs, so we can help you minimise your corporate tax in China. With their deep understanding of local practices and applications, our dedicated teams of professional accountants and tax practitioners—located in Beijing, Guangzhou and Shanghai—are prepared to provide true bilingual tax advisory services to foreign investors entering the mainland Chinese economy for the first time. They will continue to assist you in all matters during your tenure in China. Among other functions, we can assist with the preparation and filing of corporate tax returns; negotiate with tax bureaus; and provide advice on other Chinese tax compliance and advisory needs, including Enterprise Income Taxes, Individual Income Taxes, Business Taxes, and miscellaneous local taxes and surcharges. We will alert you to any changes as they occur, with forecasts of what might be on the horizon as the Chinese economy continues to progress. 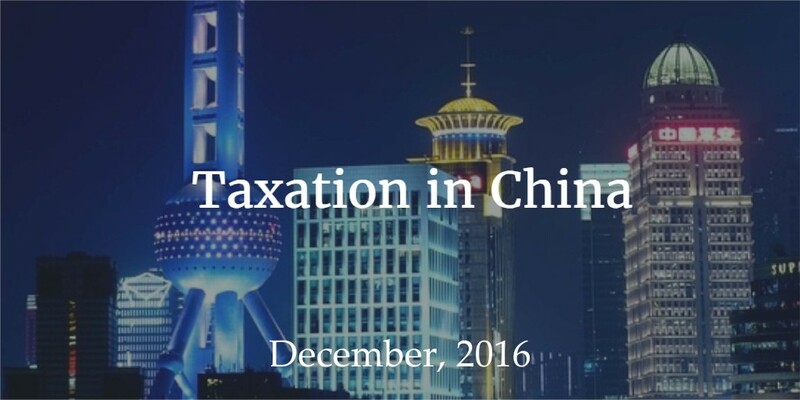 Currently, the standard corporate income tax rate in the PRC is a flat 25% for all corporations, foreign or domestic. However, you may receive a substantial tax break if your WFOE is a small or high-tech company. In the spirit of encouraging investment, the China tax rate for small business is as low as 20% in some cases. If your business is a high-tech company, such as a computer software/hardware firm or an electronics firm, you will pay a corporate tax rate of just 15%—an excellent incentive to invest in China’s growing economy. In addition to the basic corporate tax in China, we will advise you on the Value-Added Tax (VAT) charged against the import and sale of goods, as well as installation, processing, and repair services, and any other indirect taxes you may face. The VAT is typically 17%, falling as low as 13% in some cases. While capital gains taxes are added directly to the taxes of domestic Chinese corporations, WFOEs and other foreign businesses receive an automatic 10% reduction in Capital Gains taxes. The individual Capital Gains rate is a flat 20%, although non-resident foreigners also receive a 10% reduction—not just on Capital Gains, but also on Dividends and Royalties earned, as well as a 10% deduction in Interest (plus a 5% business tax). As with corporate taxes, we will advise you on the best way to handle these taxes to your maximum benefit. Fung, Yu & Co. CPA provides a wide spectrum of bilingual individual income tax compliance and advisory services, specialised for expatriate staff and executives. With a deep understanding of local practices and applications, we can assist in the preparation and filing of individual income tax returns, negotiate with tax bureaus, and advise you on other tax compliance and advisory services. Our goal is to help you retain as much of your personal income as possible when resident in mainland China.